You hear a lot about oil. You kinda know what it is and where it goes but do you know when you should change it? Oil keeps everything in your engine lubricated. You don’t want metal on metal contact because the next thing you know you’ve got smoke and where there is smoke, there is fire. And really big repair bills. And nobody wants that. You need to check your oil regularly. Not just how much is in the engine but the color. The color of your oil can tell you a lot about what’s going on in your engine. The color of a clear-ish brown is good. The color black is bad. It means it’s time to take your car to Elkhart Mechanics to get it changed! An oil change is when you drain out the engine oil from your car and refill it with fresh oil. It is not a major repair, and some garages only do oil changes, even if they do not do repairs. Elkhart Mechanics is a full service garage, and we are pros when it comes to oil changes and other routine maintenance. It is necessary to change your oil periodically, because the oil gets burnt over time and stops providing sufficient lubrication to your engine, which causes its parts to wear out. Old oil also cannot protect your engine from acids, water, and debris. Because of the extreme temperatures in northern Indiana, we recommend changing your oil approximately every 5,000 miles. You may want to change it more often than that if your vehicle is old, if you often drive on unpaved roads, or if you drive a pickup truck or van that frequently carries heavy loads. It is not difficult to check your own oil to determine whether it is time for an oil change. When you check your oil, make sure the engine is cool and the car has been turned off for at least ten minutes. 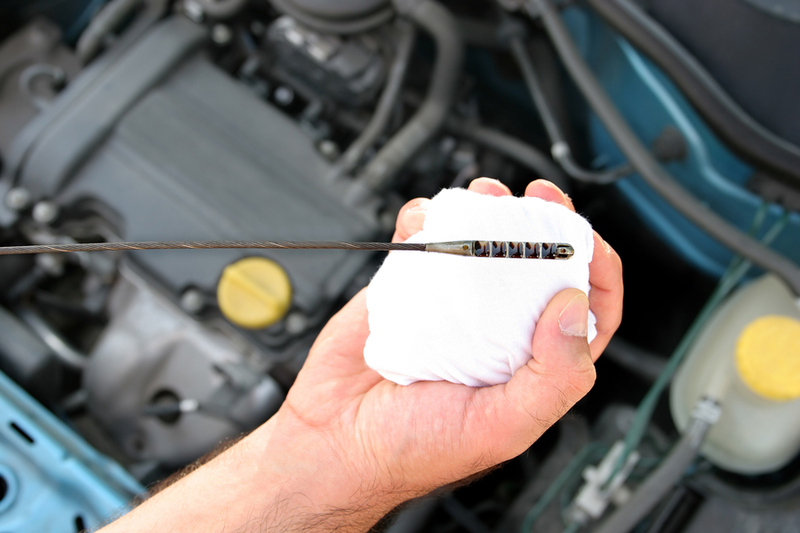 Remove the dipstick from its pipe and wipe it off on a cloth. The dipstick should be marked with lines that say “add” and “full” or something similar. Then reinsert it and see how far the oil comes up on the dipstick. If the oil level falls short of the “full” mark, you just need to add more oil, which you can do on your own. You should also look at the color of the oil. If it is clear, light brown, it is still fresh. If it is dark brown or black, it is dirty and needs to be changed. Elkhart Mechanics can give your car a quick oil change at a good price.